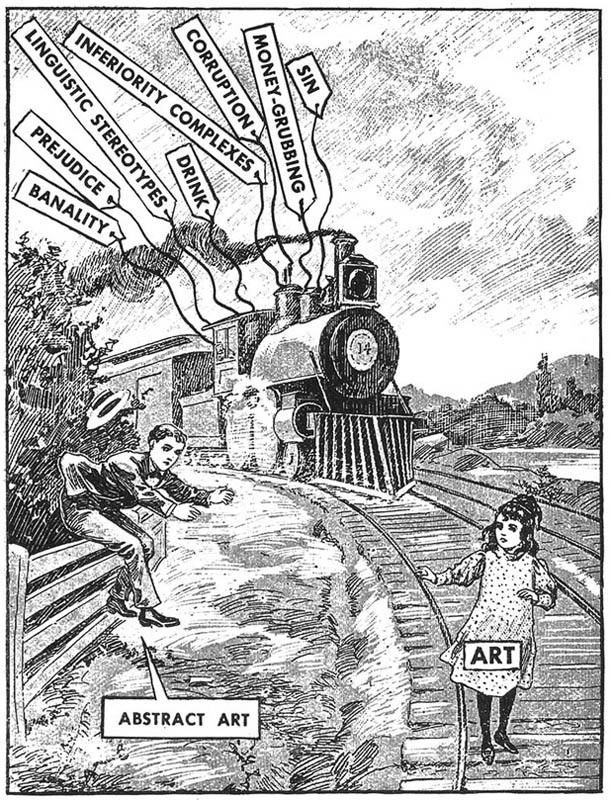 Ad Reinhardt cartoon via Hyperallergic, image courtesy David Zwirner Gallery. Fine art can only be defined as exclusive, negative, absolute, and timeless. It is not practical, useful, related, applicable, or subservient to anything else. in an essay "Twelve Rules for a New Academy" could also be a brilliant cartoonist, an insightful photographer, and a painter of famously "black" paintings. 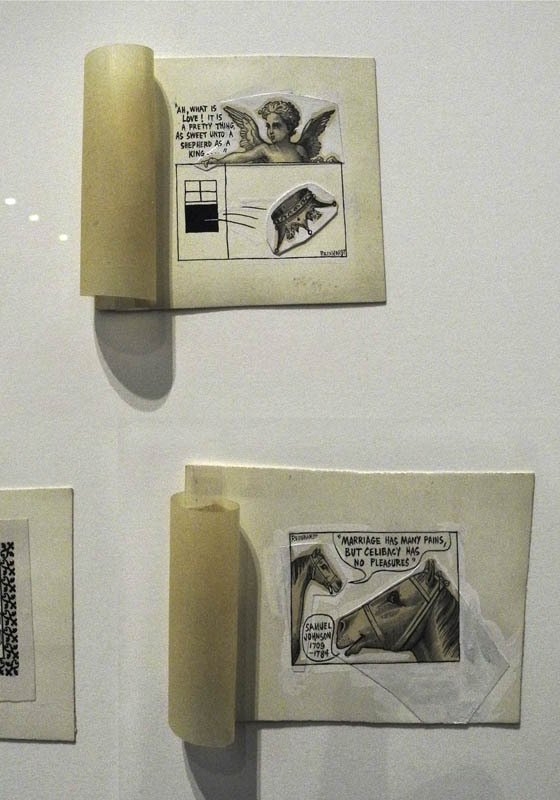 Yet Ad Reinhardt (1913-1967) is all that, and a writer of intense prose. In a recent remarkable exhibition at David Zwirner gallery, we could see the range of Reinhardt's output, his piercing intelligence, and his sharp eye. One large room was dedicated to Reinhardt's cartooning work, of which the most widely known are his art cartoons, such as the one above. Reinhardt drew from the position of a leftist and many of his cartoons appeared in leftist newspapers or magazines such as The New Masses and PM. He was intensely critical of the new art market. Why do artists paint? What do they mean? –– We can't do your thinking and looking for you (the way a hearst-paper does) but we'll try to help you know what you're looking at and for and so represent something yourself. 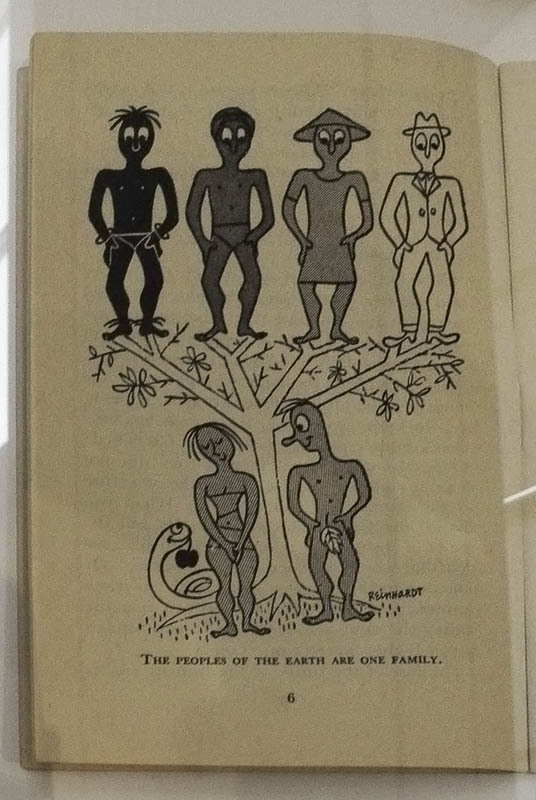 I did not know his other cartoons, such as the one above about the human family. I was surprised and delighted by cartoons on other subjects, such as these on love and on marriage. The first quote is from a 16th century poem by Robert Green, "The Shepherd's Wife's Song": "What lady would not love a shepherd swain?" Then there were these whimsical little bugs. 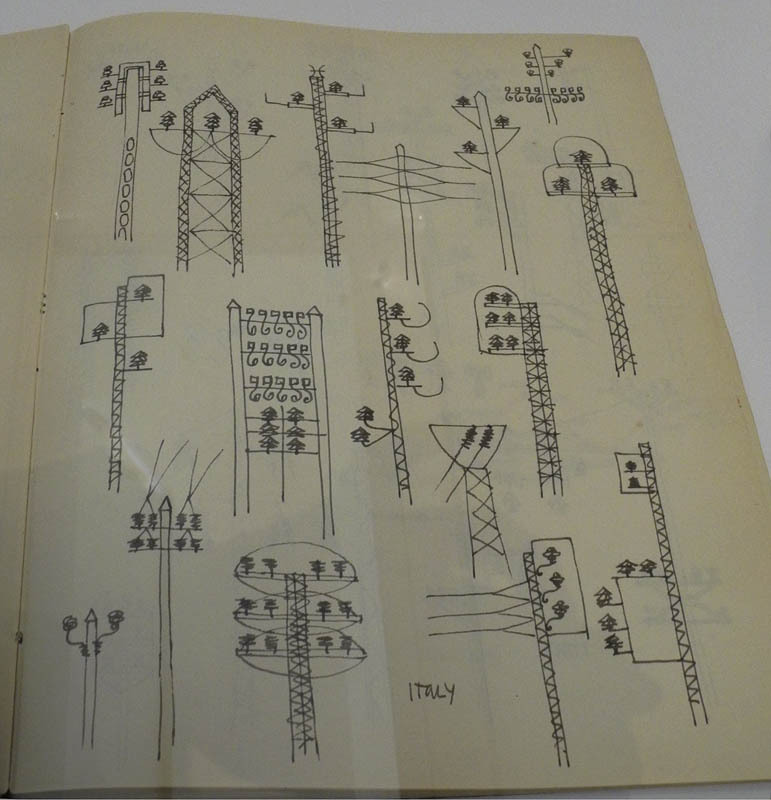 I loved this page of sketches, precise yet lighthearted, of Italian electrical pylons in all their variety. A page from a notebook explores Eastern religions, stating "Religion begins where theory ends." There is an interesting video, a walk through guide by Robert Storr, the curator of the show, in which Storr talks about this room of the exhibition in depth. The aspect of Reinhardt's work that was a complete surprise to me, and was wonderful to see, was his photography. 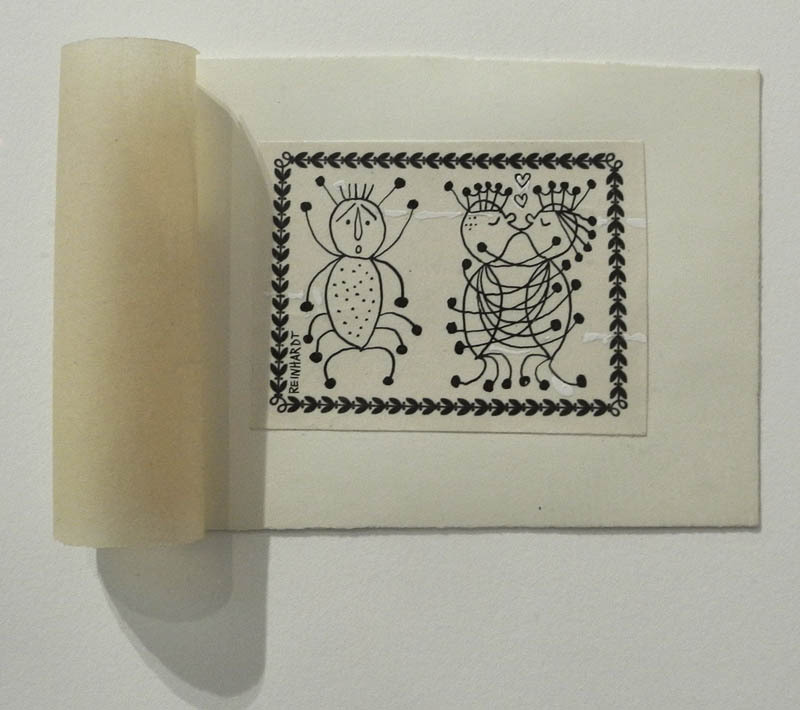 The image above is the cover of a small catalog that the gallery provided, with an essay by Prudence Peiffer. 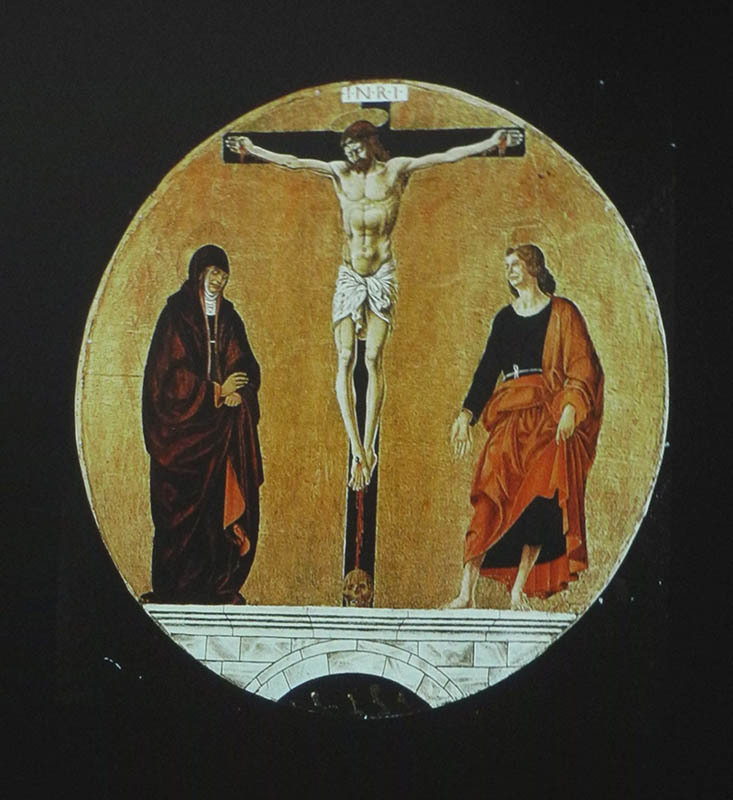 Reinhardt traveled widely and was open to all images, from great artworks to accidental markings. 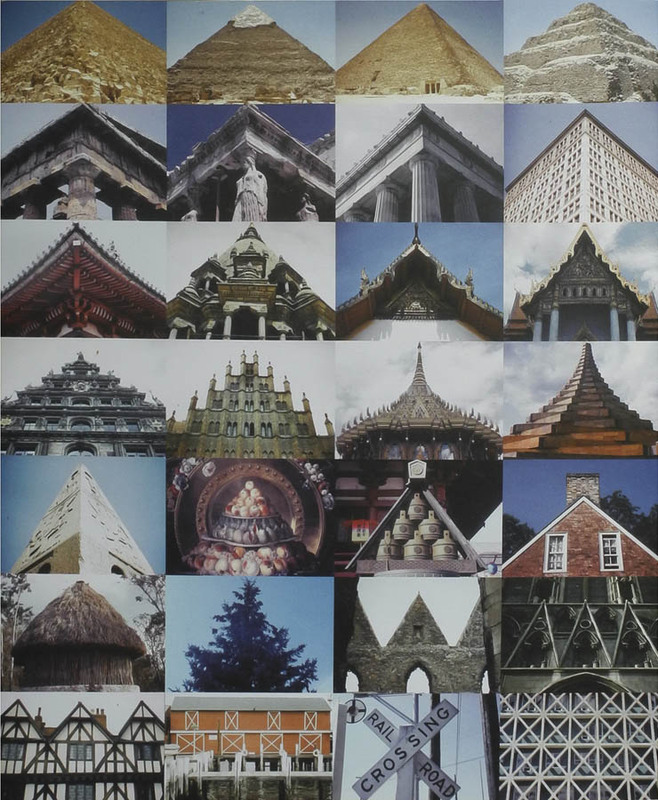 He had a collection of over 12,000 slides, which he showed in organized formal groupings to friends, students, and at the Artist's Club in what he called "non-happenings". ....and on two more elegant architectural details. In the compilation of images above you can see a few more of the visual themes he explored. 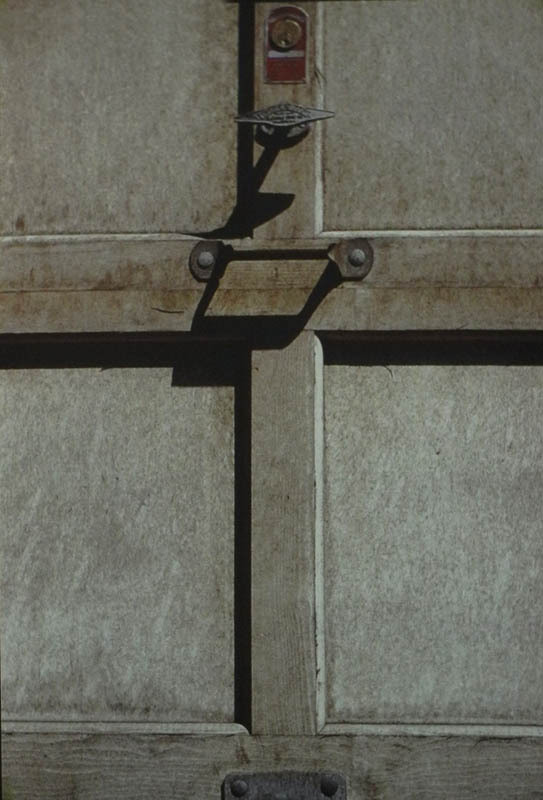 The slides show a mind constantly thinking and alert to the visual subtleties of the world. The one standard in art is oneness and fineness, rightness and purity, abstractness and evanescence. The one thing to say about art is its breathlessness, lifelessness, deathlessness, contentlessness, formlessness, spacelessness, and timelessness. This is always the end of art. ......These paintings and comments present no clear understanding, no precise ground plan for our labors to follow. 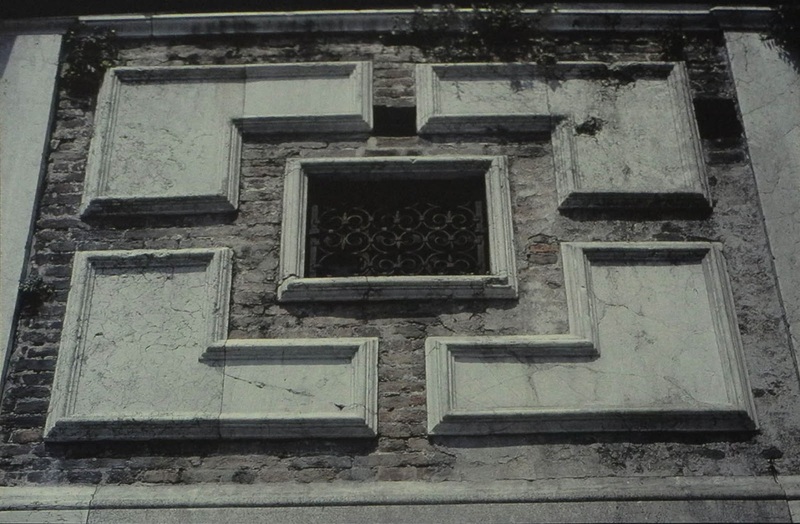 They represent only bricks and mortar materials awaiting use in the shaping of our own individual understanding. Until that time they remain but random comments.  You can read this essay and others here in the collection Art-as-Art: The Selected Writings of Ad Reinhardt. 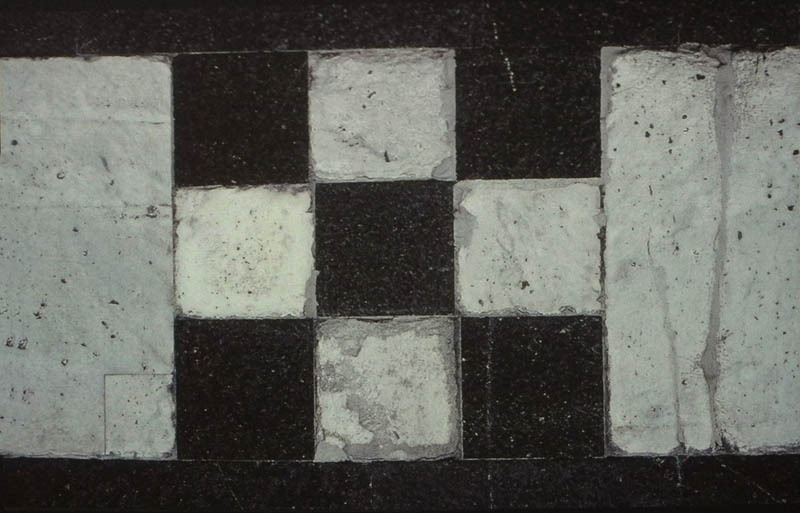 Abstract Painting, 1960-66; oil on canvas, 60 x 60 in. Collection of Guggenheim Museum. Everything into irreducibility, unreproducibility, imperceptibility. Superb post, Altoon! When I went to the exhibit I anticipated sitting a while with the black paintings, but quickly got sidetracked with the discovery of Reinhardt's sharp wit and keen eye in the cartoons, drawings and photographs. It was absolutely mesmerizing. It turned into a long, long, long visit to the gallery that day. Thanks, Tamar. It was a remarkable show. A New Painting: "Green Curve"
A New Textile: "Three Color Diamonds"
Hans Hofmann: More than "Push/Pull"
How Wonderful to be Outdoors!